Do you know the 5 steps for lifesaving CPR? More than 350,000 people had sudden cardiac arrest outside of a hospital in 2017. Those who received CPR were two to three times more likely to survive. Joshua Moeckly, a Mayo Clinic cardiac nurse, explains the five steps you should go through in an effort to save a life. 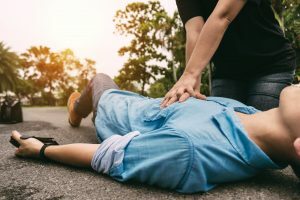 It’s a moment everyone hopes they never experience, but it could happen any time: finding a person in cardiac arrest unconscious and nonresponsive. Make sure the scene is safe before approaching the person. Call 911 and get help on the way. If the person is not breathing and has no pulse, Moeckly says it’s time to start chest compressions. Using both hands, push down on the person’s sternum about 2-2 inches. Moeckly says, from there, the best thing you can do is to repeat the process until the person wakes up or help arrives.